The tax treatment of pensions and pension schemes is currently undergoing a period of rapid development across the European Union. Following publication of the European Commission Green Paper on Supplementary In June 1997, the Council adopted a Directive on safeguarding the supplementary pension rights of employed and self-employed persons moving within the Community (Council Directive 98/49/EC of 29 June 1998). This work aims to stimulate the debate in this area both on a national and a European level. The importance of the European dimension is apparent from an analysis of the application of EC competition rules to pension funds, particularly those funds which are granted exclusive rights to provide benefits to supplement state social security systems. It is argued that increased competition in this sector is likely to benefit pension provision in the long term. 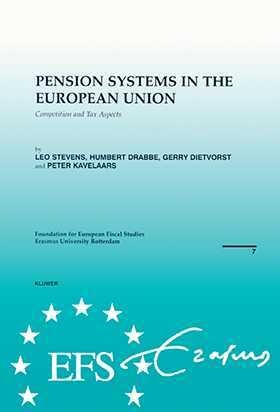 Against a background overview of the different types of pension schemes in EU Member States, the book goes on to consider the question of harmonisation of certain tax rules with respect to pensions. Whereas important differences exist between the various schemes, nearly all grant some form of tax privileges aimed at encouraging supplementary provision. The need for uniform rules is most clearly shown in the application of assignment rules on tax, social security and pensions with regard to workers in cross-border situations, where various Member States apply significantly different rules. The papers collected here are the result of a seminar organised by the Foundation for European Fiscal Studies of the Erasmus University Rotterdam. This brochure is the seventh in a series initiated by the Foundation, which organises post-graduate courses on European tax law, and aims to encourage research on the economic and legal aspects of tax harmonisation and coordination in the European Union.